This is going to be a blast–join us for s’mores, trail mix, and fun conversation with the author of Eden Lake, Jane Roper. The novel is currently #22 on the Kindle Top Rated Literary Fiction list–it’s a popular summer read and we’re excited to host an evening dedicated to literary summer fun! Jane is a freelance writer, blogger on Babble, and is the mom of 4 year-old twins–gotta figure that’s good for a story or two. 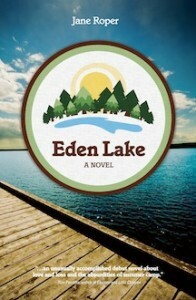 The book is set in 1998 at a progressive children’s summer camp in Maine, whose visionary director dies unexpectedly, leaving his adult children to sort out the future of the camp and, in so doing, their own lives. The book was inspired in part, by the Maine summer camps Jane’s parents worked at or owned during her childhood.